Dulcia piperata: . . . mittis mel, merum, passum, rutam. eo mittis nucleos, nuces, alicam elixatam. concisas nuces avellanas tostas adicies, et inferes. Translation: Add in honey, wine, raisin wine, and rue. Mix into this pine nuts, nuts, and boiled cracked wheat. Add chopped toasted hazelnut and serve. Most Roman sweets tend to be like this: mix together a bunch of sweet things, and serve. We’re used to slightly more composed desserts, so I endeavored to create a modern cake (using the ingredients above) that wouldn’t seem out of place to a Roman. To do this, I started with a recipe from a truly excellent twenty-first century Italian pastry chef: Gina DePalma, of Babbo. 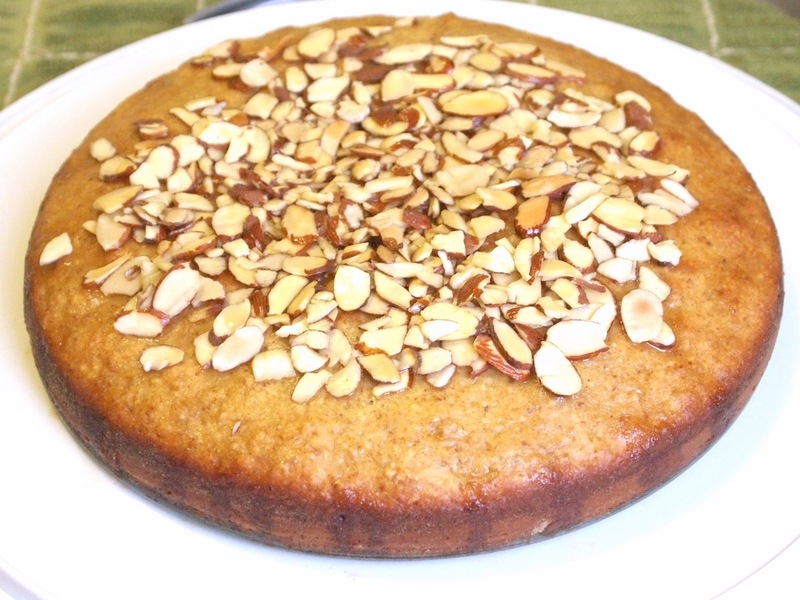 Gina’s recipe is for a really lovely almond olive-oil cake with a simple lemon-based glaze. I thought the nuts and the oil in this sweet were not only classically Italian, but classically Classical. Her cake uses almond flour, sugar, and lemon, though – none of which were available in the Roman pantry. So, I substituted ground toasted almonds for the almond flour (this gave some of the grainy texture the cracked wheat would have imparted to Apicius’ dessert), used honey in place of sugar, and brought in the Apician raisin wine in the form of a syrupy reduction with which I soaked the finished cake. 1. Preheat the oven to 350 degrees. Grease and flour a 9-inch round cake pan or springform pan and set aside. 2. Whisk the flour, almonds, baking powder and salt together in a medium bowl. 3. In a large mixing bowl, whisk the eggs briefly – just until the yolks begin to blend in. Add the honey, wine, and oil and whisk the mixture vigorously for about 30 seconds. 4. Add the dry ingredients to the bowl and mix with a whisk until everything is well combined, then mix for about 30 more seconds. 5. Pour the batter into the floured pan and bake for 30 to 45 minutes, rotating the cake pan halfway through to ensure even browning. Bake until to pull away from the sides of the pan, it springs back lightly when touched, and a cake tester inserted in the center comes out clean. 6. Allow the cake to cool for ten minutes in the pan, then gently remove it and allow it cool completely on a rack. 7. While the cake cools, make the syrup. Bring the honey and muscat just to a boil over medium heat, then reduce and whisk until the mixture reduces about halfway. 8. Assemble the cake: Prick the top of the cooled cake all over with a fork. Sprinkle the toasted almond slices on top, then pour the syrup over very slowly, a little at a time so it soaks in instead of running off the sides. This looks beautiful! I love the sweet wine syrup too. This is perfect for a brunch! Yum! This cake sounds extra delicious in all of it’s simplicity. The wine syrup sounds downright decadent! Oh my goodness gracious… all I can say is WOW… it looks and sounds delicious! I love poaching pears in muscat… never thought to use it in a cake. Genius! Hi Celia! Hmmm I liked the idea of using muscat wine for syrup! I love drinking it but this is a really good idea that I should take a note! Does the syrup leave alcohol taste? Can kids eat just fine? @Nami @ Just One Cookbook – Glad you like the idea! The alcohol in muscat – as in any other wine – cooks off during reduction, so the syrup is nice and smooth and sweet. This is amazing! Olive oil cake is so good — never had it this way though. Love the muscat syrup. Very nice! This looks so delicious and dense! I want. This is dynamite! I can’t wait to try such a simple, but tasty recipe! Feed this to the Lares Familiares and they will protect you and yours for all time. The Roman theme is great and the recipe rocks. I am so glad to have found your site.